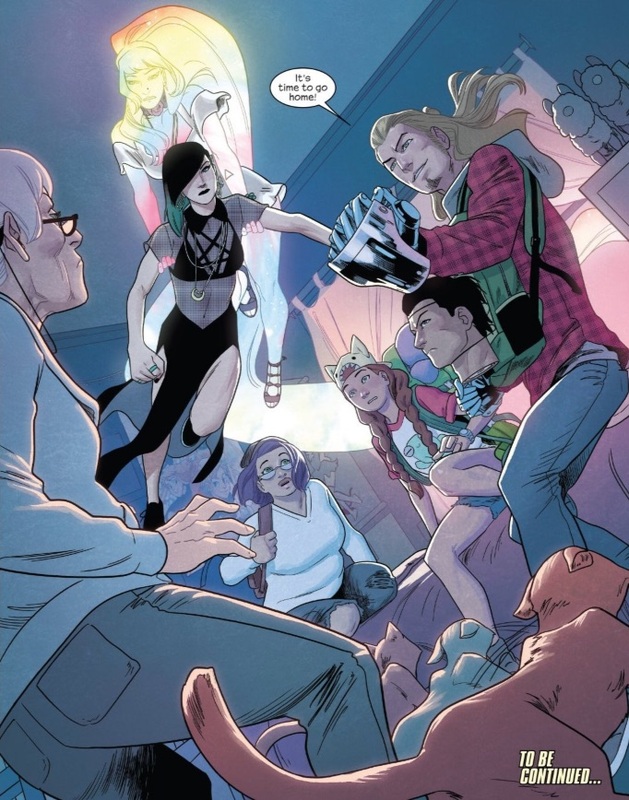 The band is finally getting back together in Runaways 5. After a few issues that establish the new normal, make sure all the characters are alive and show us what has and hasn’t changed in their personalities, Rainbow Rowell is ready to give the former Runaways a common goal. There is no better person to have at the center than Molly, the character who is simultaneously the most and least vulnerable. 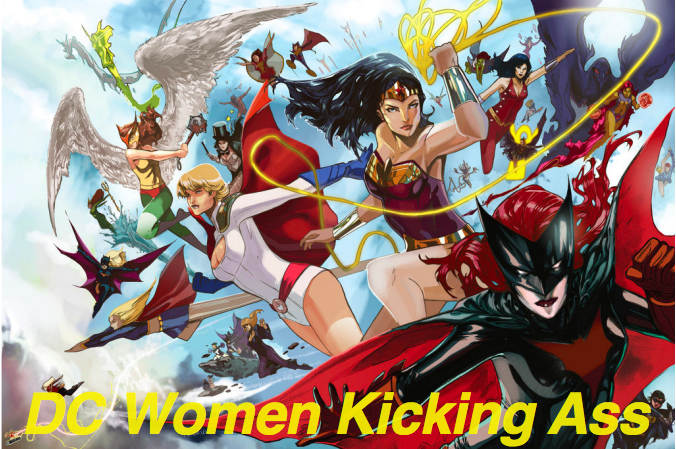 The issue’s narration is third person limited and offers Molly’s perspective. Given what we know about Molly’s anxiety about her Grandmother’s cats and their telepathy, the distance from her point of view reflects her own dissociation from herself inner voice. Molly has been living with her Grandmother, mortgaging her own privacy and autonomy in order to have the security of family. Well, the security of family which includes trips to Disneyland and cookies. It’s only when she sees Gert make the same choices that she realizes that they need to leave. 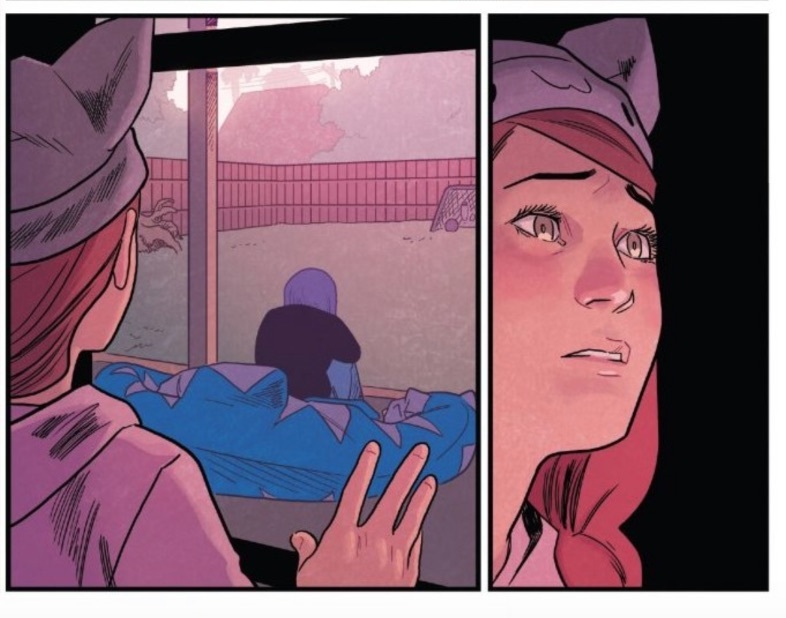 Kris Anka captures the moment in a panel that focuses on Molly as she gazes on Gert through the window. Molly’s expression takes on a more sophisticated and mature look. The despair in Molly’s eyes is stark, especially for a girl in a bunny hat. Rowell lays out the situation by giving Molly exposition that doesn’t feel heavy handed. It may have been two years, but Rowell is able to imbue the interactions of the former Runaways with the comfortable rhythms and established dynamics of siblings. Or not, in Nico’s case. She makes a pass at Karolina who immediately calls it out as acting out a pattern. As for Chase, he and Victor get the least angsty of the plot lines as Chase’s prattling finally pushes Victor to stop playing possum. Victor’s annoyance with Chase has the cadence of a brother complaining about sharing the backseat. Rowell introduces the idea of whether Victor wants to stay alive but doesn’t allow the character or the story to linger too long in that morbid space, because the more immediate need is to save Gert and Molly. This issue ties the three threads together with a splash page that shows the whole crew together and ready to take on Molly’s evil scientist Gramma. Rowell leads us there with three separate storylines that each underline the affection and underlying obligation that these characters feel for each other. They are family. 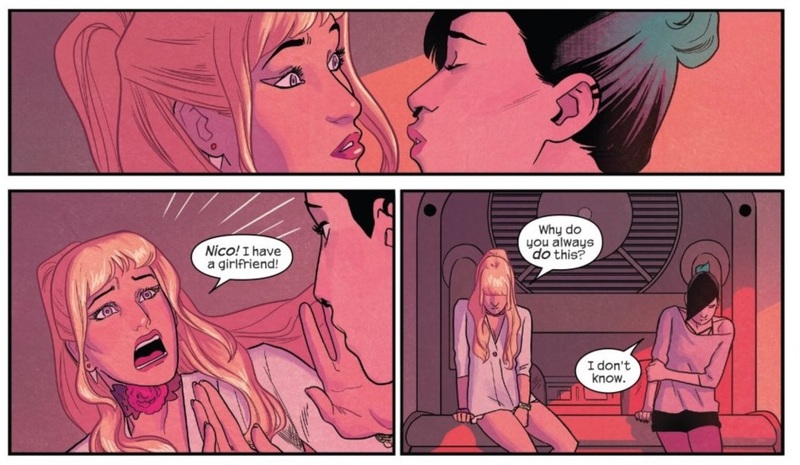 Especially after seeing the tense Nico and Karolina scene in issue 3, I had a prediction that Nico had tried to kiss Karolina during the off page stuff that set up this run, and that had caused a rift between them. Looks like I was right. And if I remember correctly, Nico has never tried to kiss Karolina before. It has long been hinted that Nico is bisexual, but this is the first reveal. I love how it is done. So casually, that it feels like a normal part of her character and not a massive reveal. That being bisexual is normal. All while effortlessly expositing about the time skip AND uses it to establish a historic pattern for the Runaways with an entirely new event AND using one of my favourite Runaways tropes, Nico making really, really poor romantic decisions as a way to deal with stress. 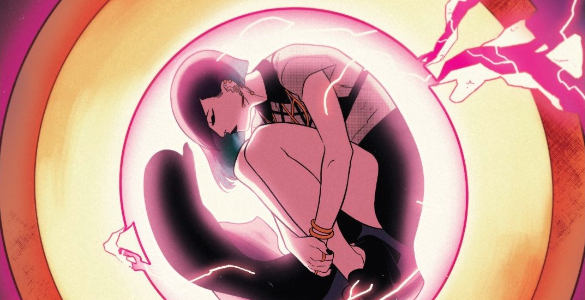 I always found this aspect of her fascinating in how it interacted with her leadership position (she’s basically abdicating control of her relationships in an attempt to escape the stresses of being in charge), and is a big reason why she’s my favourite character in the Runaways. Again and again, this book deserves to be praised for its emotional realism. Still deserves it. The Nico kiss is a great example, but so is Victor’s struggles with his own pain. The Victor/Chase stuff is the funniest sequence, but I highly disagree that it is the least angsty. Victor is very obviously messed up, and there is a suicidal subtext to a seemingly fun scene that makes it much angstier than anything else. But it is a great example of how one can both be angsty and funny in the same scene. And then there is the ways that Molly’s arc throughout this issue is handled. With such subtlety and grace. Molly usually doesn’t get the complex emotional payload, but here she gets a complex arc, told wonderfully in a way that relies just as much on the art as the script, perfectly harmonious. So good.